SOLD: Thank you Casey from SD! SOLD: Thank you to Bob of MN! This is a sweet boy we got early this summer that needed some TLC. He is growing a ton and slowly gaining. Will be a gorgeous boy once he is looking like he should! He has a great performance pedigree and a bright future ahead of him! Jac would be great for your next prospect for Reining, Ranch Pleasure, Working Cow Horse, Penning/Sorting, etc! He is a beautiful dunskin to boot! His sire is an own some of Hes A Nifty Jac by Hollywood Jac 86. Dam is a daughter of NCHA Money Earner Creeks San Badger by Peppy San Badger. Second dam by Dun Its Sug by Hollywood Dun It. Still a little shy to catch, but once you have him he just melts with the attention. He is going to be one of those sweet, gentle, in your pocket types once he fully comes around to trust people. Not a mean bone in him. Someone is going to get a really nice gelding here! Located in Norwalk, WI. (Can haul between WI and TX the beginning of October.) Asking $1,500 for now. Once fully slicked up his price will go up. SOLD: Thank you Nick and Amber! BDF Colonel Willy - "Willy"
SOLD - Thank you to Annette! You two are going to make an incredible team! Sire of our 2017, 2018, and some of our coming 2019 foals. Now standing in eastern WI. Can follow him on his Facebook Page. We are VERY excited to announce the purchase of our up coming stallion. We have searched long and hard for a prospect that had both color and a proven pedigree. This guy is it! His sire is an own son of South Texas Acre who has NCHA $26,000 and is the son of Bob Acre Doc, NCHA Hall of Fame and NCHA $426,000. His dam is an own daughter of the late, great QT Poco Streke (APHA World Champion, NRHA $ earner, and sire of MANY performers). We have plans to have this boy finished and shown in NRCHA, NRHA, and APHA events. First foals arrived in 2016! See our FOALS page and SOLD page to see what he is producing! BDF Stylish Tuxedo - "Tux"
This colt is going to be spectacular! Take a look at his pedigree! Loaded with performance earners and producers! This boy should have it all: pedigree, conformation, ability, and not to mention color! 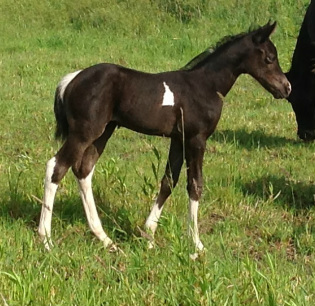 Double Homozygous Black and Tobiano! Definite performance and stallion prospect!! SOLD: Thank you to the Carpenter's from MI! Amber will be going with her sister, Holly. BDF Ambers Lucky Risk "Amber"
We are excited to get Amber back and see how she has grown up. 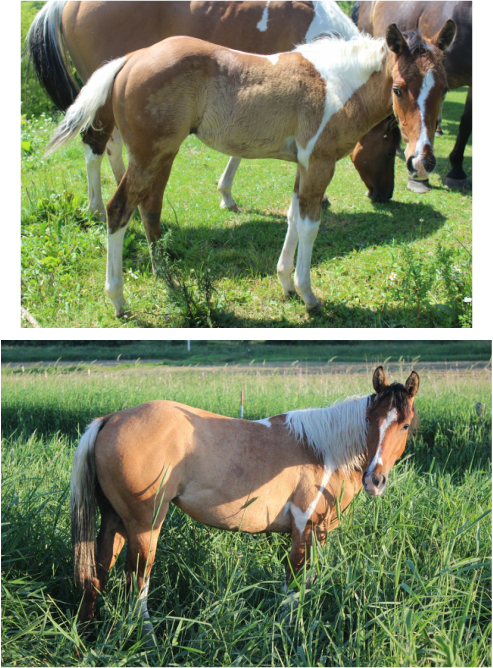 She has truly matured into a lovely mare! Amber is out of our own daughter of the legendary performance horse and sire, Ris Key Buisness and sired by our previous stallion, Patches Lucky Straw. She should be a top notch performance prospect and later be a great asset to a performance paint horse breeding program. We plan to get her started under saddle right away and breed her to South Texas Hold Em for a 2019 foal. SOLD: Thank you to the Carpenter's from MI! Holly will be going with her sister, Amber. This has been an amazing cross (Lucky and our daughter of leading performance horse, Strait From Texas) and this filly looks to be no different! Her two full sisters both sold as foals, one to TX and one to TN. I have LOVED these babies and am SO excited for another filly out of this cross! 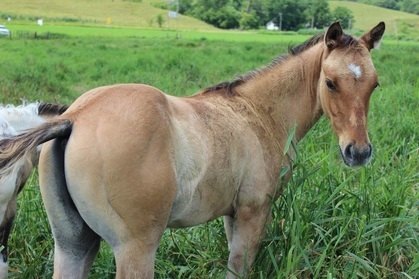 And to top it off she is a BEAUTIFUL BUCKSKIN filly! I am in love! We are excited to welcome this beautiful girl to our program! She had a rough start in life but due to some wonderful people is doing wonderfully now! IN FOAL to South Texas Hold Em, grullo tobiano stallion, for 2018! 2017 - Dun Tobiano Colt, by South Texas Hold Em. SOLD IN FOAL for 2018 - Thank you to Shani in MN! Diaman H LilTuff Risk "Lady"
We are of course thrilled to have another daughter of the great performance horse and sire, Ris Key Buisness. We especially love the disposition on our Ris Key offspring and expect Lady to be no different. Her bottom side isn't too shabby either! Her dam's sire, Lil Peppys Sugar Bar, was the 1995 NRHA Open Derby Champion and has $7,700+ NRHA and is the sire of NRHA $$, AQHA pts and more. He is an own son of the one and only, Peppy San Badger! Lady was lightly started as a three year old. We plan on finishing her out under saddle and look forward to some incredible foals out of her! 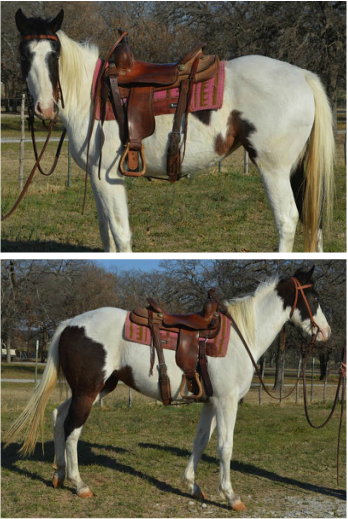 2013 - DBR Riskeys Lil Lena, bay roan tobiano mare, by Colored Me Blue. 2014 - Diaman H Tuff N Peppy, bay tobiano mare, by Diaman H Risky LilPep. 2015 - dunskin tobiano stallion (deceased), by Pepsis Color Master. 2017 - bay solid filly, by South Texas Hold Em. BDF Miss Lexi Boon - "Lexi"
Flyer x Leroy Filly - "Flair"
Our last foal of 2016 has arrived and we are going out with a bang! Flyer delivered an absolutely STUNNING solid grulla filly on June 17th. This girl is HUGE, well built, correct, and the most naturally people loving foal! When she sees you she nickers and comes right over to say high! 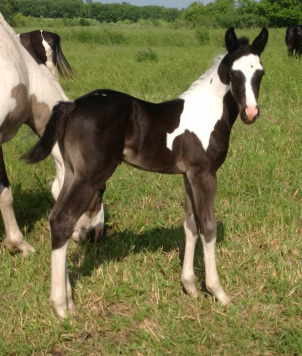 She may have missed the tobiano color, but this is a VERY well bred APHA grulla filly! Her dam, Peppy De Flyer, is an own daughter of the legendary Delta Flyer, APHA Hall of Fame. Delta Flyer himself was a NCHA Super Stakes Champion with over $260,000 NCHA. Her dam's sire, Gold Doc Bar, won over $100,000 NCHA. She is sired by our own, South Texas Hold Em. His sire is an own son of South Texas Acre who has NCHA $26,000 and is the son of Bob Acre Doc, NCHA Hall of Fame and NCHA $426,000. His dam is an own daughter of the late, great QT Poco Streke (APHA World Champion, NRHA $ earner, and sire of MANY performers). 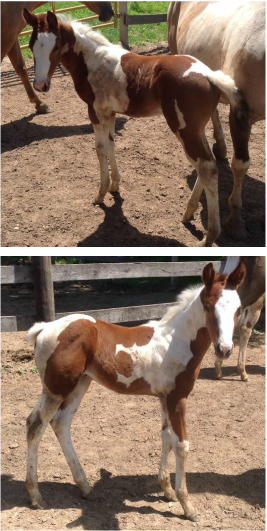 This filly should be an incredible performance prospect and later go on to produce cow bred dun factored APHA foals! SOLD! Thank you Jocalyn! You two will be an awesome team! UPDATE: May 2017 - Started under saddle and I couldn't ask for more! She has taken everything in stride! One of the NICEST fillies to work with! REALLY excited and proud of her! You will LOVE this girl!! SOLD: 2 in 1 package in foal for 2018. Bit Of Diesels Moon "Nakota"
Nakota is a beautiful 7 yr old dun tobiano mare. This girl stands 15.1hh. 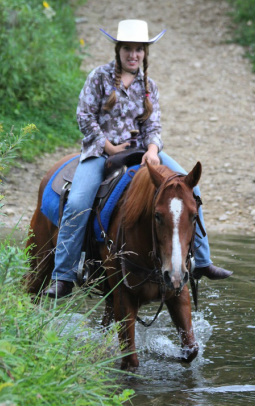 She is started under saddle, has been round penned, ground driven, and ridden on trail. She has yet to hesitate when asked something new. Likes to be worked with and has a great head on her shoulders. Ready to continue training now! She is greener then she should be between my having babies and her having babies. Even with big chunks of time off, she rides right off again every time! This girl could go in a variety of directions. She has a big stride and forward way of moving. Full brother is running barrels. She would be a great speed prospect and I think would be excellent english as well! To top it all off, she is homozygous for not only black but dun as well!! So as a broodmare she will ALWAYS have dun and grulla foals! This sweet girl has a bright future ahead of her as both a riding horse and producer! 2015 - BDF Lady Liberty, dun tobiano mare, by Patches Lucky Straw. 2016 - BDF Premium Diesel, dun solid colt, by South Texas Hold Em. SOLD: Thank you to Claire Slattery who is putting in a lot of time to work this nice colt off! You two will be an awesome team! SOLD: Thank you Becky Westholm from MN! Tuxie x Leroy Colt - "Smoke"
We are beyond thrilled with this boy!! He is stunning in every way!! Double homozygous and a splash carrier as well! 5 Panel N/N by parentage. Not many grullo tobiano colts with this quality performance pedigree! Definite performance and stallion prospect! SOLD: Thank you Siemers Family! BDF Premium Diesel - "Phin"
We are excited to welcome this beautiful first cross of South Texas Hold Em and Bit of Diesels Moon (Nakota)! This boy is big and beautiful right from moment one! While I was hoping for tobiano, this guy makes up for it everywhere else! He is going to be one awesome using horse! He has a lot of bone and power already with a cute head and great conformation! He is guarenteed to be Homozygous Black. He has a 50% chance of being Homozygous Dun, however since he is a solid I do not plan to test him. If someone would like him tested, I would be happy to send the test off. He will make an awesome using gelding that should excel in just about any direction you choose to go! SOLD: Thank you to the Smith family!!! Miss Wildfire x Leroy Filly - "Tiger Lily"
This darling girl is sired by South Texas Hold Em and out of the wonderful old mare, King Dreams of Jean, AKA Miss Wildfire. Her dam has an old foundation AQHA pedigree with Continental King, Skip A Row, and more close up which you don't find anymore. Miss Wildfire is a PHBA point earner and spent many years as Michael Martin Murphey's main riding and music performing mare. She is now retired from riding. 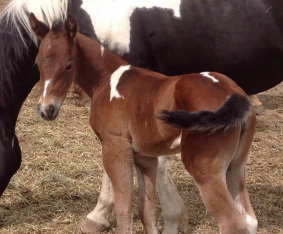 This is her ONLY APHA foal and may possibly be her last. This adorable filly is a great prospect for many areas: reining, cow horse, other cattle/performance events, competitive trail, 4-H, and more. She should mature around 15 - 15.1hh. Her color genetics are Ee Aa Tt and she is N/N for the genetic disease 5 panel by parentage. She is FOR SALE for $2,250 with a deposit and payments until weaning. Reasonable shipping available! Delta C Me Fly "Rosetta"
Rosetta is another AWESOME daughter of “Delta”. Rosetta has 120 days + with reined cow horse trainer, Luke Jones. She also has many trail miles all over the country: CO, SD, NM, and all over the Midwest. 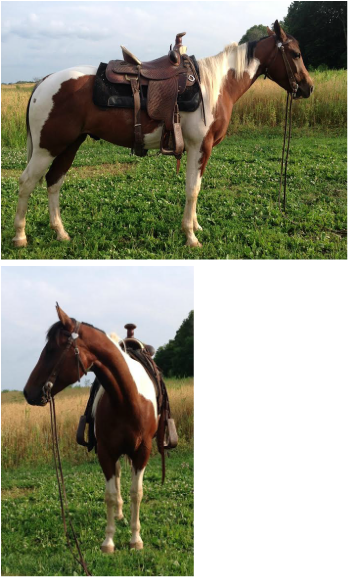 She has a TON of natural ability and would be a huge asset to anyones APHA cutting/cow horse program. Take a look at her pedigree!! Not a single hole in it! She is loaded with “GREATS” everywhere you look! EVERY horse on her face papers is an earner and/or producer with several Hall of Fame horses. Not many paint mares out there with her breeding! The only reason she is for sale is we have her full sister, Glory, that we are keeping. 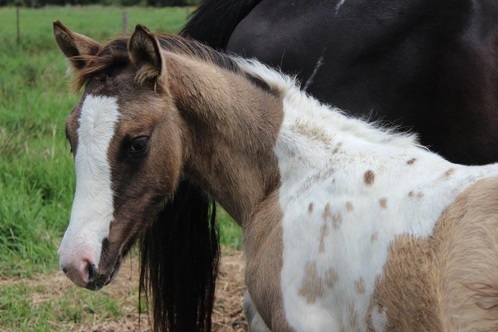 2015 - buckskin tobiano colt, by Patches Lucky Straw. SOLD! Will be staying and standing in WI! Thank you to Wade and Teresa of Pulham Paints! Sire to our 2013-2015 foals. Go Lucky & Lucky Pierre. show his offspring in the future. 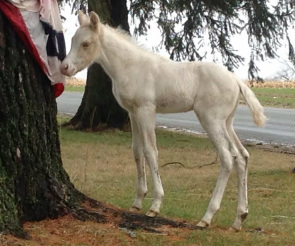 Lucky is homozygous for the tobiano gene so you are guaranteed a paint foal! 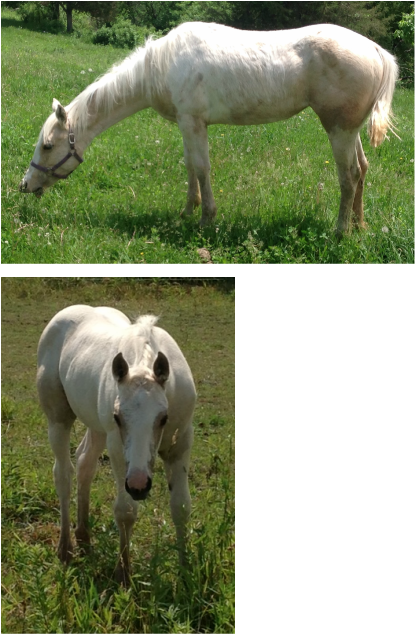 including buckskin and palomino, with no chance of getting a solid foal! disposition, he can compliment a wide variety of mares! ALL OFFSPRING HAVE BEEN SOLD! ﻿SOLD- Moving to TX with return customer, Jody! This beautiful boy was born at 9:15pm on June 13th by two royaly bred parents! I could not be happier with the result! You simply do not find this INCREDIBLE cow pedigree with this color combination! He is going to be OPEN quality and could be a huge cornerstone to a cowbred paint program! This is the colt you have been looking for! 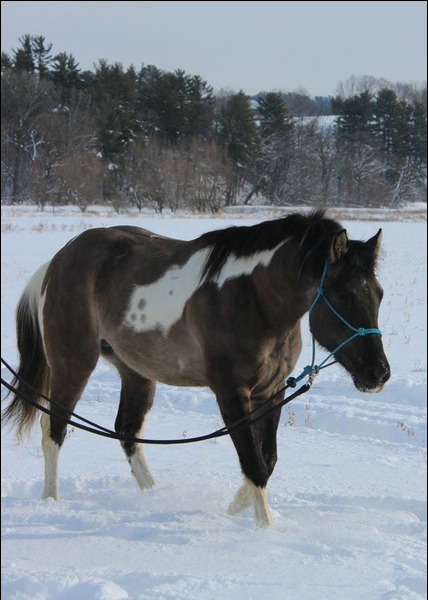 Show him and breed him and help change the face of tobiano cow horses! SOLD: Moving to IL! Thank you Humberto! BDF Lucky Riskey Yesi "Yesi"
This is a special filly out of a very special mare! She should have a one in a million disposition, knowing both her sire and dam. Her dam is an own daughter of legendary sire, Ris Key Business. This girl has everything going for her! Proven pedigree, great disposition, well put together, athletic ability, and incredible color to top it off! Take this girl to the performance arena and later raise some spectacular foals! This stunning colt unfortunately missed the color, but don't let that fool you. He has an INCREDIBLE cow pedigree that is loaded to the max with MANY of the all time GREATS!! He is still going to be stunning . . . solid black without a speck of white! Every one of the foals out of this awesome, proven mare has been OPEN performance quality! He will be able to compete with the best of them! Cutting, cow horse, roping, etc. If you are looking for an awesome show prospect and using gelding, don't pass this guy up! His price would be double if he had color, so this guy is a steal! (AQHA) Blueburn Fancy Pants "Georgia"
We got this filly in on trade and we are excited to add this beautiful girl to our herd. She has a sweet disposition, some great foundation and cow breeding, and is gorgeous to boot! We are looking forward to starting her under saddle soon! SOLD - Staying in WI! Ty N Golden Tyree "Cisco"
Cisco is a stunning coming 4yr old dunskin gelding. This beautiful boy doesn't have a speck of white. He has a wonderful, people loving, outgoing disposition that is just a joy to be around. He has about 60 days under saddle. Walk, trot, lope, drag a tarp, pull a tarp over his head, had a rope thrown off him, shot a gun off him, you name it. This is the kind that is hard to find! He is everything you need in a great using horse! Brains, beauty, size, and heart! 100% sound in all ways. Ready to continue training your way! Excellent barrel, roping, mounted shooting, etc prospect. Pictures do not do him justice! Must see to appreciate! Have more pictures and VIDEO available! SOLD to IA - Thank you Megan! This darling girl is out of our own daughter of the legendary performance horse and sire, Ris Key Buisness and sired by our own, Patches Lucky Straw. She should be a top notch performance prospect and later be a great asset to a performance paint horse breeding program. SOLD - Staying in WI. Molly has a soft spot with us. She had been mishandled in the past and had some trust issues to overcome and still has some "quirks", but she has become such a cornerstone for us. She is WELL broke and is one we can use to help train 2 yr. olds. She loves to be used and is always ready to do the hard jobs! 2011 - Moe, Blonde Colt, by Sunny. SOLD - Thank you to the Earp family in IL! SOLD: Thank you to Steve and Janabeth of Stoney Hollow Paints in TX! BDF Gay Bar Gypsy "Gypsy"
Here is a bay tovero filly out of Misty and by APHA Champion and multiple World Champion, Gay Bar Drummer. This girl is an excellent show and broodmare prospect!! She has both a proven sire and dam and is APHA Breeders Trust Enrolled. 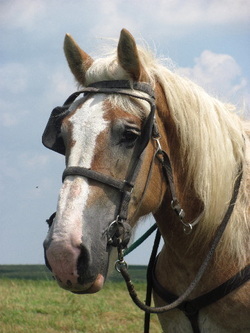 She is a tovero which makes her a high color producer on solid stallions. She is also homozygous for the black gene. You can go any direction with this girl! This filly was spoken for, but is now available! She is a RARE combination of color with great performance bloodlines!! Her dam is an own daughter of $3 MILLION Dollar sire, Peptos Sylish Oak (by Peptoboonsmal), and out of an own daughter of Leo San Cita. 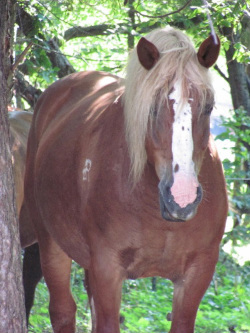 Her sire is a ranch/roping stallion going back to the greats Blue Valentine and Gooseberry. This filly will be an incredible performance prospect and later go on to be a MAJOR color producer!! Don't miss out on this one! SOLD: Thank you to Roger and Denise of Indian Mound Paints in TN! This girl could not be marked any more perfect for me! I LOVE the minimals! This girl is out of our own daughter of the legendary performance horse and sire, Strait From Texas. This filly's full sister last year quickly sold to a show home in TX. She should also have loads of potential as a performance prospect! She is put together beautifully already! She is also homozygous black, so will never produce a red foal! SOLD - Thank you to Jody in TX! If you are looking for a powerful roping prospect or just like the stout boys in general, take a look at this handsome boy! He is built like a brick house and will be able to do any job asked of him! His sire is an own son of Docs Delta Dude (877 APHA pts, 9 ROMS, 6 Superiors, 2 x Res. World Ch. and 1 x World Champion - Steer Stopping, Heading, Heeling, Tie-Down Roping, Reining, and Working Cow Horse). I simply love this boy! His looks, his build, his personality. Someone is going to get a good one here!! Currently being started and doing excellent under saddle! SOLD - Thank you to return customers Steve and Janabeth Devolt from TX! This adorable girl is most likely our last foal by our wonderful, proven mare, Misty. Misty is going to be starting her new carrier as our daughter, Evelyn's, babysitter! Misty is a proven producer of Top 5 at APHA World in Reining and Working Cow Horse, Congress Youth Reining Champ, Sorting Money Earner, Roping Money Earners, etc. Every one of Misty's foals has her incredible disposition. Very sensible, dependable, and people loving! This girl is already no different! She is going to be the tallest of our 2014 foals and should have some body to her. In 13 yrs of breeding we have never had a foal so in control of her movement within hours of birth! This girl does flying lead changes with ease. Has a pleasure slow lope, yet speed to burn as well. I truly think this girl is an all around prospect that can go in ANY direction!! Almost all white with color on her head and one front leg. Can you imagine how stunning she would look cleaned up in the show ring?!?! She will also be a MAJOR color producer in the future as she carries both tobiano and splash overo, not to mention producing palominos and buckskins! SOLD - Thank you to Karen Fox of SD! 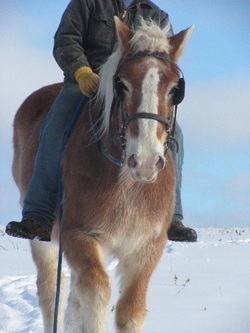 Annabel is bred to excel in roping, cow horse, penning, ranch versatility, trail, etc. She will be stunning when she sheds out gold like her momma! Beautiful filly! SOLD - Thank you to Jerry and Sandy Allen of WI! This beautiful girl is a full sister to Annabel, our 2013 palomino tobiano filly. She has beautiful markings and is a golden palomino already with about 80% color. She has a darling head and is starting to fill out already. If she is put together anything like her sister, she will be a knockout! This will be a great using mare and a color producer in the future! Jill is an absolute sweetheart, loves people, and is very calm and sensible. She was very green broke when we got her but she is now well on her way to being considered well broke. She will hitch to anything, very quiet and obedient, safe around different environments, etc. She is doing great and is going to be an awesome asset to our herd. We can't wait to see what kind of foals she can produce. We think they will be dandy! 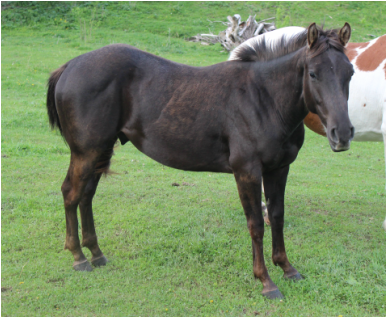 Jill is in foal to an awesome Reg Belgian pulling stallion for a May 2014 foal! 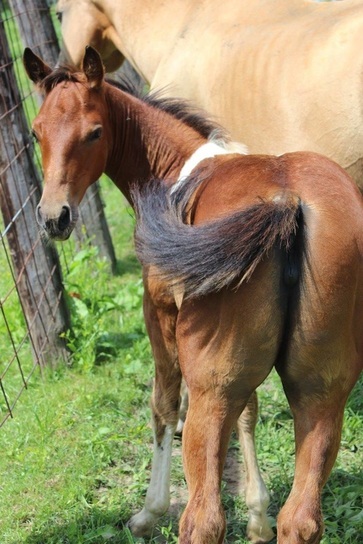 2012 - John: Sorrel Colt, by Sunny. SOLD to TX! Thank you Steve and JanaBeth! This boy has been dreamed of for YEARS! I can not be happier with the outcome of this cross! This boy is going to be phenomenal!! His sire is A Tru Rolex, multiple World Champion and #1 Point Earning Stallion in APHA History! His dam is a paternal sister to the 2nd Point Earning Stallion in APHA History!! This should be a powerful cross and I can't wait to see this boy shine! He is your next performance/stallion prospect deluxe! Homozygous black and N/N for the 5 panel! Deposit will hold until weaning. Payment plan available. Pictured at one week old! SOLD to TX. Thank you Steve and JanaBeth! This stunning filly is sired by our stallion Lucky and out of our daughter of legendary performance horse and sire, Strait From Texas. This girl is bred to work a cow and look good doing it! She could be your next cow horse, reining, or roping prospect but should be versatile enough to excel in a variety of other disciplines. She should mature around 14.3hh and with excellent conformation. She will also later be able to produce some top notch COLORED foals! This girl will be a great asset to a paint performance horse program! Deposit will hold until weaning. Payment plan available. Pictured at one week old! Thank you to the Voigt family for giving King a great home! King is one of those guys that is worth his weight in gold! He is WELL BROKE to both ride and drive. While he has mainly been driven, this guy will move right off with just a squeeze and a kiss. Safe for anyone to handle. This is one you let the kids love on, climb on, and learn to drive with. He is older, but is aging well and does not have any arthritis issues and holds weight well. He should have many good years left. Thank you to Eric & family for giving Wayne a great home! Wayne is well broke to drive and ride. This guy is QUIET! He is very gentle, easy to handle and work around. He has been used in all sorts of hitches, on all sorts of farm equipment, wagons, etc. He has been used extensively to train young drafts to drive. He is very dependable regardless of what is being asked of him. You will fall in love with this guy's gentle disposition. Thank you to Barb, Ethan, & "Feather" for giving John a great home! John is WELL BROKE to drive. This guy will hook to all farm equipment, wagons, bob sled, you name it. He has been in many different hitches, either side of a team, and drives single as well. He also rides!! He has mainly been used as a driving horse, so he needs some work on leg cues, but he goes along great. 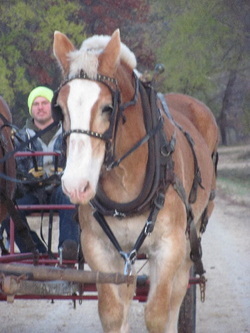 He is very quiet and easy to handle on the ground, under harness, and under saddle.